Mackie has long been a serious contender in the pro audio business, but it seems like 2017 is the year that it makes a serious and dedicated push into the home and small studio. Already, we’ve seen the company expand the Big Knob series from one model to three across multiple price ranges, and launch a new and improved MR series of monitors. Now, the company is getting into audio interfaces with the new Mackie Onyx Artist 1•2 and the subject for today’s review, the Mackie Onyx Producer 2•2. As the name suggests, the interface offers two inputs and two outputs, but it also offers a strong and well-built design with MIDI inputs and outputs. It’s relatively inexpensive too, coming in at $150. But how does it perform? And are there better alternatives? We put it to the test to find out. The first thing you’ll notice about the Mackie Onyx Producer 2•2 is its design, and it looks typically Mackie. That’s a good thing — we like the sleek black look, angular design, and the characteristic “big knob” for master volume control — although that big knob is a lit smaller than what you’ll find on the Big Knob monitor control series. Speaking of size, the interface was quite a bit smaller than we expected. We see that as a good thing — it’s built for home and small studios, but it could easily fit in a bag or backpack for on-the-go recording without adding too much extra weight or bulk. It measures 2-inches tall by 7.4-inches deep by 4.5-inches wide (51 x 188 x 114mm), and looks right at home amongst other Mackie products, or any other pro audio equipment you’ll have lying around. It weighs in at 1.35 lbs, or 0.68kg. As mentioned, the device is really quite built. It offers a solid metal exterior, and the knobs feel super premium and strong in use. That’s good news for something that could ultimately become a portable interface, as it should be able to withstand most of the abuse you can throw at it. On the front panel of the interface, you’ll find the XLR/TS inputs with gain knobs and a switch to make them “Hi-Z,” or high impedance inputs. You’ll also get a wet/dry-style knob to mix your input and DAW signals, as well as a phantom power switch, monitor volume knob, 1/4-inch headphone jack, and volume knob for said jack. Keep in mind that the phantom power switch controls both inputs — which means you won’t be able to use a microphone that needs phantom and a microphone that can’t handle it at the same time. The back is a little simpler — which we think is a good thing. 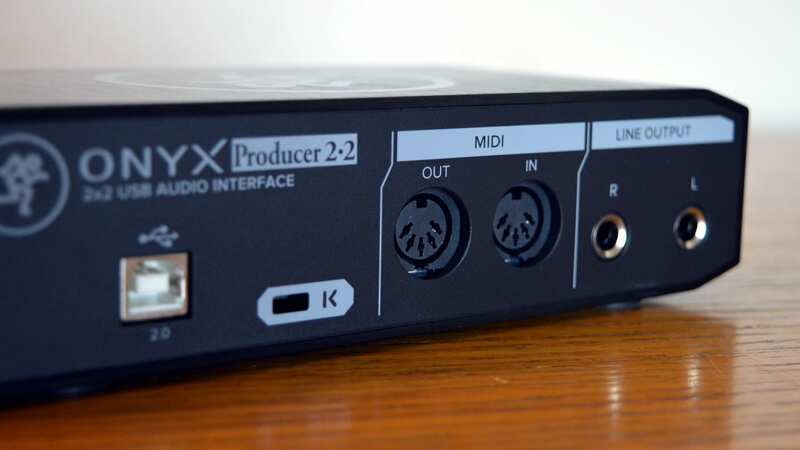 You’ll get the MIDI in and MIDI out ports, as well as your line output jacks and the USB port. In general, we liked the design and build of the Mackie Onyx Producer 2•2. It’s built both to look good and to function well, and our assessment is that it should last for years to come given its top-tier build-quality. Design and build-quality are important enough, but what really matters is how the interface sounds. Thankfully, it sounds great. 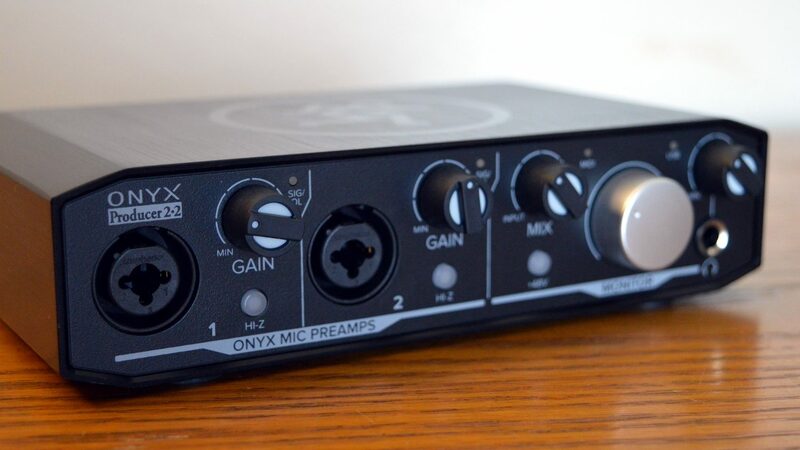 The interface comes with Mackie’s Onyx mic preamps, which have been proven time and time again to offer clarity, detail, and an overall pretty transparent sound. That’s good news for home and small studios, where sound-altering is normally done in the box and versatility is key. The interface is capable of recording up to 24-bit 192kHz audio, which is also better than most interfaces in this price range. We also didn’t have any issues with the A/D converters in this interface — things were recorded accurately and with a high-quality sound. That’s expected from Mackie. Latency was a non-issue here, and while some argue that USB 2.0 is beginning to get a little dated, it was more than capable of handling multiple recording tracks and MIDI at the same time. Mackie has also included direct monitoring, which is helpful in cutting down on latency — instead of handling monitoring from the inputs within your DAW, you can monitor inputs directly through the interface’s circuitry. The interface comes bundled with a DAW called Traktion T7, which seemed to offer enough for budding recording engineers. The bulk of our testing was done within Pro Tools, but the interface is compatible with a range of DAWs. Mackie knows what it’s doing. The company has made some seriously awesome products this year, and that only continues with the Mackie Onyx Producer 2•2. While it’s always nice to get more inputs, the fact is that this is a serious budget option for those looking to dip their toes into recording, vocalists who only need one input, or those wanting to take their recording on the go. Perhaps the best thing about it, however, is the price — at $150, you really can’t do much better. Of course, there are some competitors, the most obvious one probably being the Focusrite Scarlett 2i2, which costs the same amount of money, has the same number of inputs and outputs, and offers many of the same features, including direct monitoring. Still, Mackie adds one thing that the Focusrite doesn’t — MIDI — which is an important consideration, especially in small studios where MIDI might be an important feature. There’s another competitor here, and that’s the PreSonus AudioBox USB 96, which has many of the same features but comes in at $99. 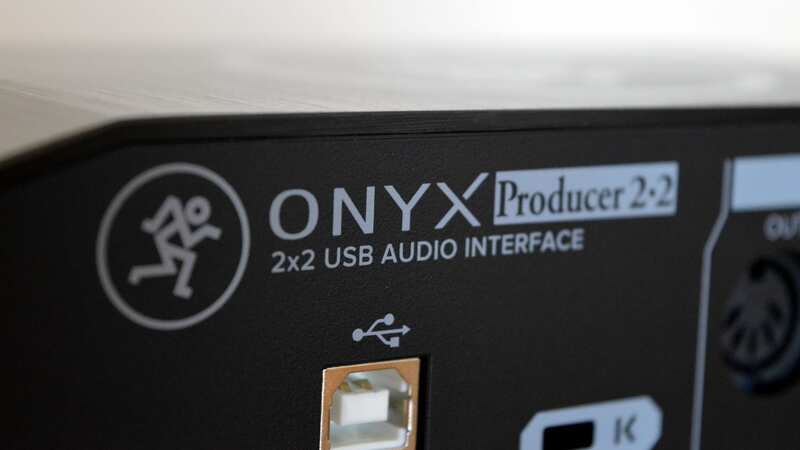 Still, it can only record at up to 96kHz, while the Onyx Producer 2•2 steps things up to 192kHz — which may be a big deal for some. 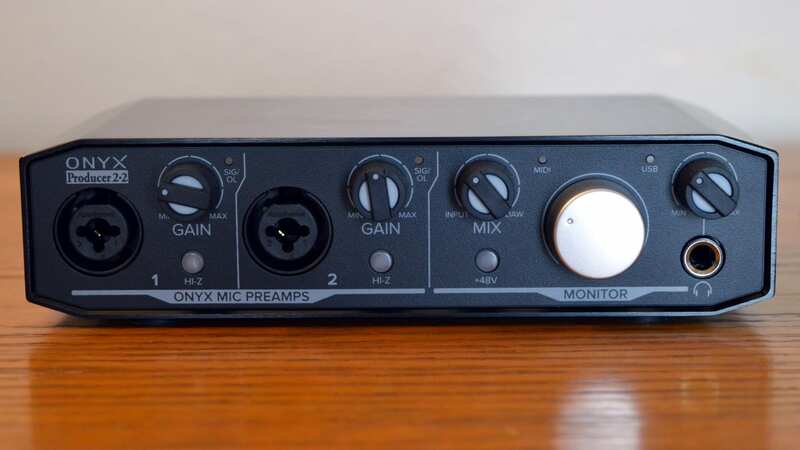 In the end, if you don’t mind spending the $150 we still recommend the Mackie Onyx Producer 2•2, but if you would prefer to save a bit of cash and don’t mind the slightly harder-to-use design and lower sample rate, then the PreSonus may be a better option. Because of its excellent sound quality, great built, and the fact that it has MIDI, we think the Mackie Onyx Producer 2•2 is the best recording interface under $150. You can get it for yourself using the links below, and stay tuned for our review of the smaller Mackie Onyx Artists 1•2.